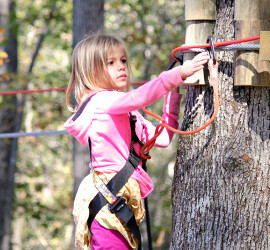 Treetop Zoofari is Richmond’s First Zip Line and Adventure Park! Located in the southside of Richmond at the Metro Richmond Zoo. This exciting tree-to-tree outdoor adventure will allow visitors to experience nature like never before, high in the forest canopy. 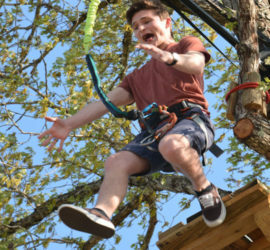 The Park offers exercise, fun, adventure, challenges and builds confidence as you travel through varying degrees of thrilling obstacles such as: jungle ropes, floating logs, tight wires, Indiana Jones bridges, a surf board zip, Tarzan swing and everyone’s favorite, zip lines. 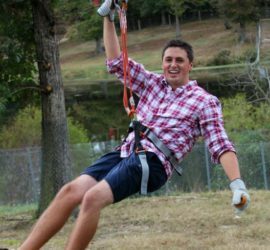 Sixteen zip lines carry you over 3000 feet through the forest and above the zoo, including a mammoth 600 foot zip over the zoo’s lake. Those afraid of heights, balanced challenged, and younger kids can get a feel for this on the lower Junior Explorer course, which has 21 challenges from 5-25 feet high and includes two zip lines. The truly adventurous can take the higher and more challenging Treetop Zoofari course which carries you 12-45 feet above the ground. This course will allow you to visit parts of the zoo that you cannot visit on foot. Get a bird’s eye view of monkeys, apes, kangaroos, giraffe, antelope, tapirs, toucans, and much more. Participants of treetop Zoofari must be 54 inches tall and plan for at least 2 hours to complete the course.